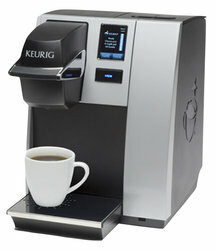 Keurig K-150P Commercial Coffee Brewer. A perfect cup of coffee, tea, hot cocoa or iced beverages with a touch of a button. With a plumbed water source, it allows for back to back brews in under a minute. Available in the Atlanta area only. All K Cups must be purchased from CV Coffee.